What a relaxing day! Curt and I just enjoyed the ship this morning and took some more pictures. The art on the Fantasy is amazing ... the pictures I took of them are not. Ha! We decided to eat at Enchanted Gardens for lunch today and the buffet was wonderful. 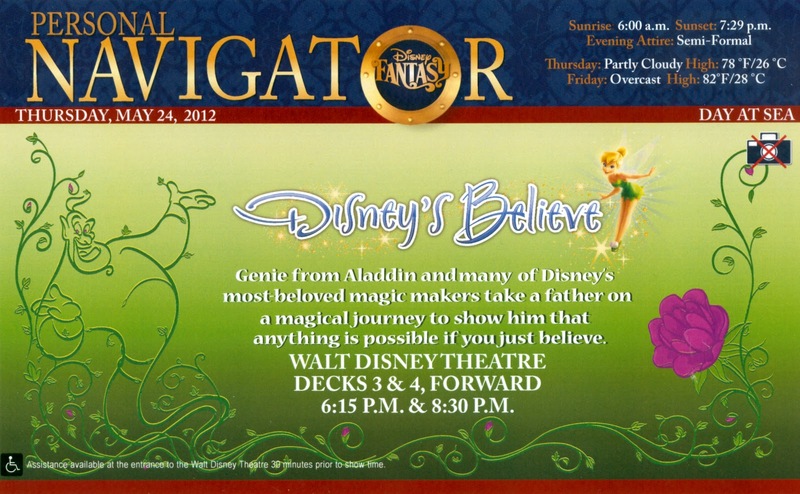 After our lunch we went to another presentation by Gary Hoffmann, an Imagineer at Disney. In the first one he talked about his latest project ... 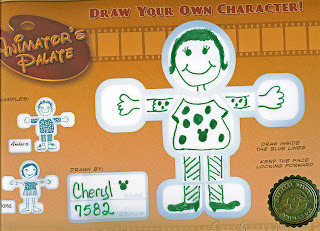 The Art of Animation resort at Disney World. He is the project manager on this and I have to say this resort looks incredible. It is another value resort from Disney and has some wonderful theming that will offer family suites. 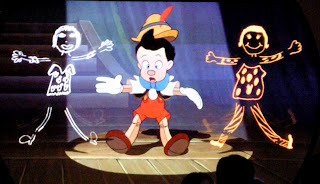 In the presentation we saw today he talked about Disney all around the world. He went through the new things happening at Disneyland, Disney World, Disney Paris, Disney Tokyo, Disneyland Hong Kong, and the new Shanghai Disney resort opening in a few years. There was a wonderful question/answer session again and I am hoping to see a Cars Land coming to Disney World. He didn't say it was coming, but I'm still hopeful! 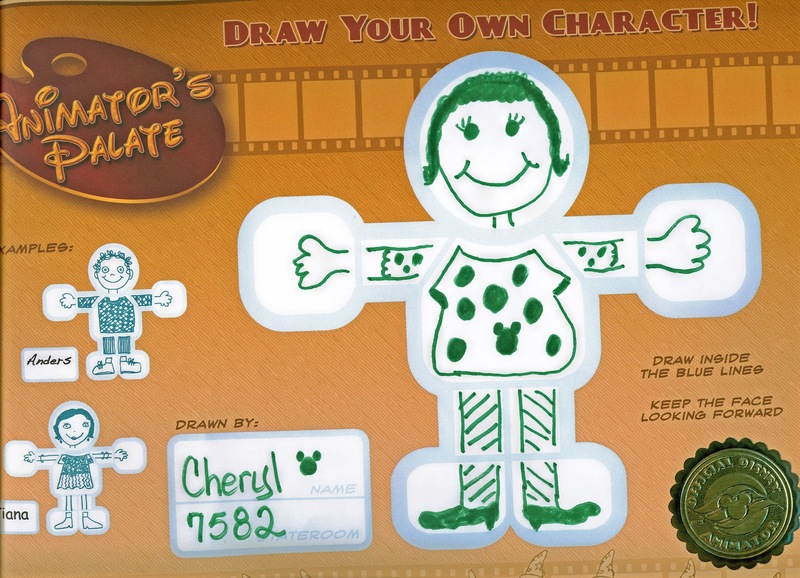 Now, on to the night I have been waiting for ... dinner at Animator's Palate and the "Draw Your Own Character" show. 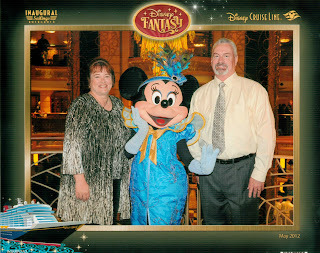 This was a semi-formal evening as you can see from our picture at the top of the post with the ever beautiful Minnie Mouse. 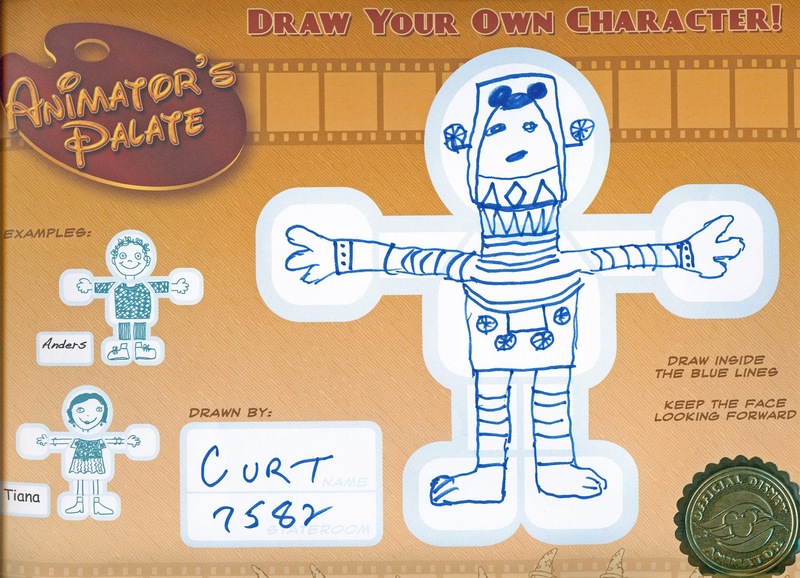 When we sat down at our table we had a piece of paper where you were to draw your character. They gave you about 10 minutes to draw and then picked up your drawings to get them ready for the animated show. These were Curt and my drawings. 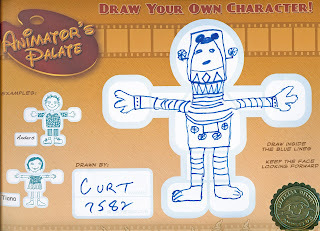 I loved Curt's sci-fi character! I am still trying to figure out why I only have one Mickey on my character's shirt and why was it a belly button Mickey????? I know it was a last minute addition, but some times I just have to laugh at myself! 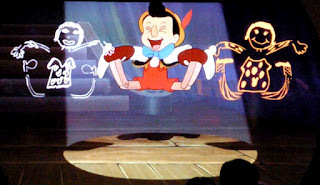 I have posted some pictures below showing the drawings animated. 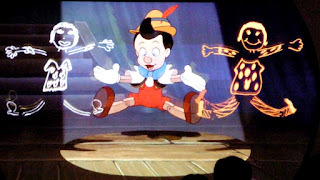 This is just so awesome ... then they add the Disney characters and have these animated drawings interact with them. 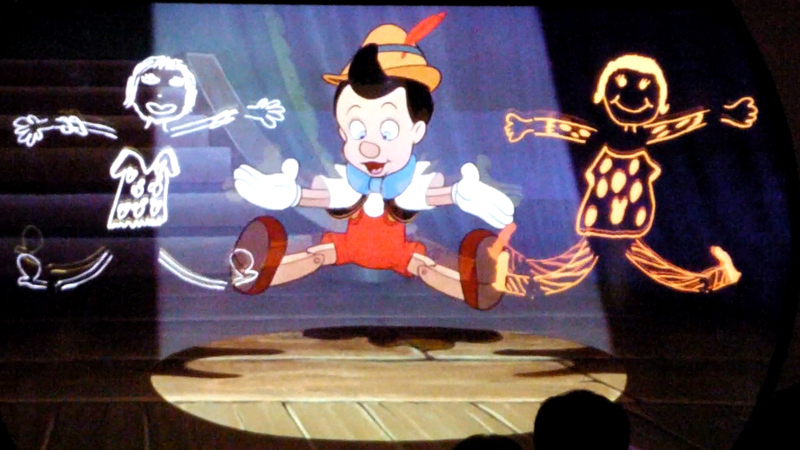 Disney is just in a league of their own regarding innovation. 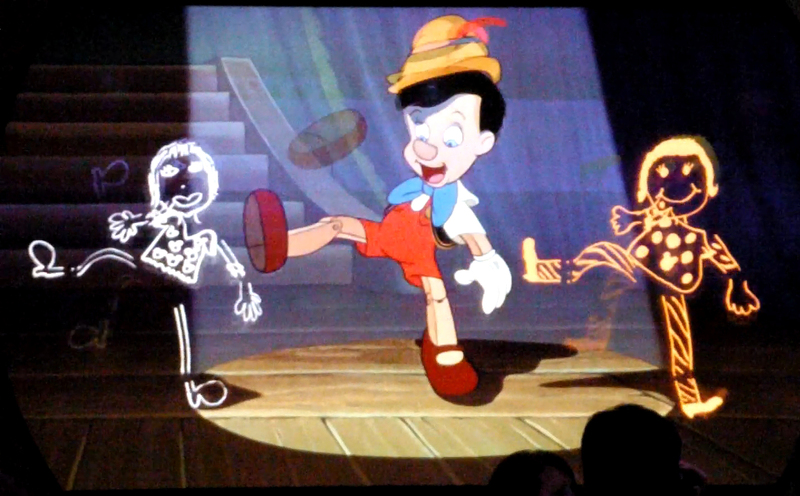 I was thrilled when I saw my drawing dancing with Pinocchio (I'm on the right in the orange)! I was going to post videos I took showing the animation, however, I just should not be allowed to handle a video recorder! All was going well until I announced (why do I talk during these things) "there's my character" ... then I proceeded to lower the camera so we saw the legs of my character. Really? I was all over the place on filming that! The video with the Disney characters was just as noisy (me talking) and chopped up. 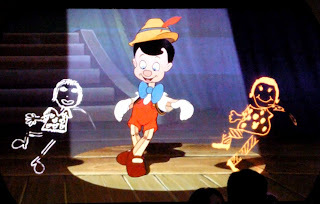 At least I managed to tape my character dancing with Pinocchio and got some stills from that. Whew!! 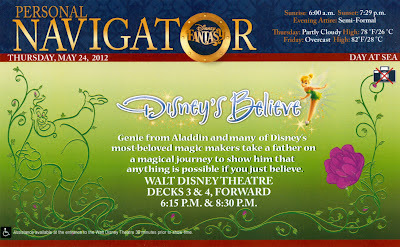 After that the night just got better with going to see our evening show. 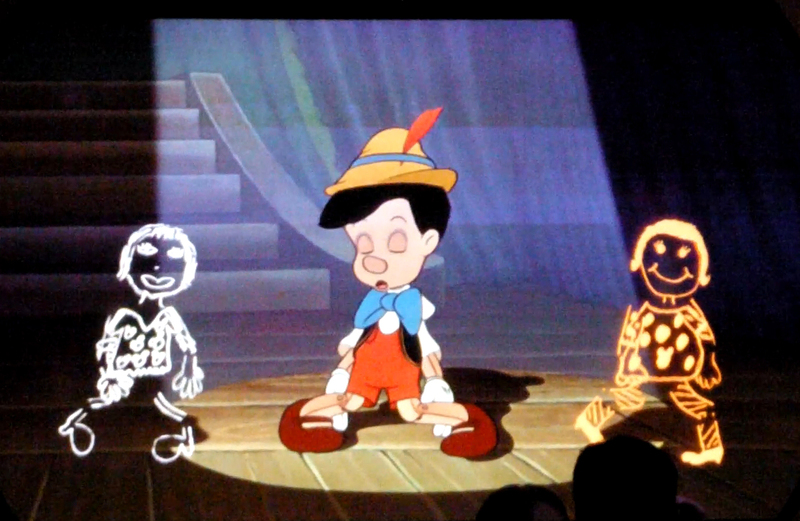 Another "shed a tear" production that Disney does so well. We decided to go to the "Tube" that evening to see the magic show with David Williamson. He was so entertaining and funny!! I forgot to take a picture of the animal towel tonight. Maybe it was the excitement in knowing that we will be at Castaway Cay (pronounced "key") in the morning. That is Disney's private island and I have heard so many wonderful things about this ... thanks for dropping by.